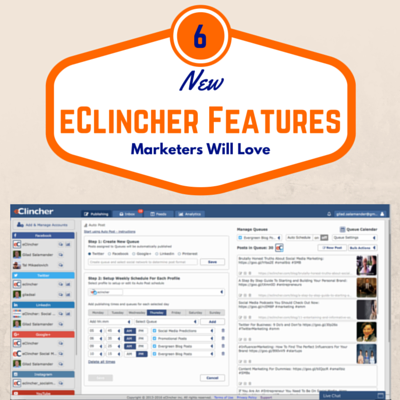 We are happy to announce six new eClincher features that are sure to make your life even easier. Many of these features are a direct result of talking with our amazing users. As always, thank you all so much for helping us to make eClincher better! Since we first released Auto Post, the feedback has been tremendously positive. Businesses and bloggers alike have raved about how much more website traffic they are seeing due to the simple fact that their older content isn’t going to waste. Despite all the positivity, there was a unanimous agreement that the ability to shuffle queues was very important. We are happy to announce a Shuffle feature that will make it easy to re-order your queues. To access this feature, you will want to click on Bulk Actions in your Auto Post tab. You will then see a new option to Shuffle your posts. Click it once or click it 100 times, the bottom line is: you will never have to manually re-order your queued content again! Bulk Upload now also supports uploading to multiple queues at once. This is a feature that we knew was missing after speaking to many active users that are relying heavily on Auto Post as a means of promoting their content. Now, when you Bulk Upload your content, you will be able to select multiple queues as the Destination. Keep in mind that each social network has specific formatting best practices, so you may want to edit your content once it is uploaded to the queues to make sure it is optimized. Bulk upload allows you to quickly import up to 150 social media posts at once. We improved the way posts are uploaded, meaning you can expect your content to bulk upload 3 times as fast as before. If you use the Bulk Upload feature often, this will make you more productive and free up even more time for you to engage with potential leads and/or customers. The Inbox was introduced to make it easier to manage notifications and messages. We are happy to announce a new tab within the Inbox for Sent Items. Not only will this make your Inbox more organized, but it will give you quick access to your outgoing conversations. To view your sent items, click on the Sent tab in the Inbox. All features, including search, filtering and tags will work in the Sent tab as well. Engaging with your fans on Facebook just got even easier. You Inbox now supports Facebook Wall Posts, meaning anytime someone writes on your Facebook Wall, you will be notified directly in your Inbox. It is important to note that Facebook has begun tracking response times and businesses that have stellar response times will receive a visible badge letting potential customers know that they can expect quick feedback to their questions or concerns. Now that all post on your wall will come directly to your Inbox, it should be easy for you to monitor and respond in real-time. This new Inbox Type is automatically turned on by default, so there is no setup required. Influencer marketing has grown significantly in the last five years, thanks in large part to social media. Many bloggers are now more influential than their significantly more popular celebrity counterparts. So what does this mean for your business? Simply put: there are certainly highly influential people within your network of social media connection. The problem is, identifying these individuals can be hard. This is where our influencer analytics can help! When you view your Twitter analytics, you will notice that there is an Influence tab. We are happy to announce that we improved this area of eClincher significantly. You can now click on any of the influencers’ names to quickly access important information such as their short bio, website, recent tweets, etc. Use this information to learn more about the influential people who follow you. Try Out The New Features Now!